Gladstone's Library is situated in the Welsh village of Hawarden, just a few miles from the Roman city of Chester. It is one of the world's great theological resources and is unique not only because it is a residential library (with twenty-six bedrooms at one end and 250,000 books at the other) but because it is Britain's only Prime Ministerial library. It was founded in 1894 "for the pursuit of divine learning" by William Ewart Gladstone, one of Britain's greatest political figures, a man who was keenly involved in the key theological and political debates of the nineteenth century. Andrew Carnegie described him as "the world's greatest citizen" and Garret A. Hobart, Vice President at the time of Gladstone's death, remarked that residential library not even in his own land was Mr Gladstone more highly esteemed and venerated than in the United States." Gladstone's Library attracts visitors from all over the world: they come to read, write and reflect; to explore the beautiful Welsh countryside, the mountains of Snowdonia and the medieval castles. Within the collection are nationally important archives of political documents relating to Gladstone. The Library has a special responsibility to preserve these and the 32,000 volumes from Gladstone's personal library at Hawarden Castle as part of Britain's cultural heritage. The building in which this unique collection is housed is also important and has been officially recognized as one of the finest and most important buildings in Wales, both architecturally and because of its historical associations with Gladstone. The bicentennial of Gladstone's birth on December 29th, 1809 was marked with events in Boston, Philadelphia and New York which were attended by two of Gladstone's great-great-grandsons. This was followed by a program of events which took place at a number of prestigious venues in Britain throughout 2009. Gladstone's Library played a leading role in these celebrations, co-ordinating events at Eton College, Westminster Abbey, National Liberal Club and Oxford University. In establishing his Library, Gladstone left a tremendous legacy, not just in terms of bricks and mortar but in terms of the values he held dear and his commitment to education and learning. Â Gladstone's Library wants to continue this work, to fulfil his vision and safeguard the collection for future generations. One way of doing this is by considering the issues which would be of concern to Gladstone if he were alive today. The Library's Trustees felt that, as a man of great faith and a great politician, Gladstone would be deeply concerned at the lack of understanding between Christians and Muslims. They, therefore, decided to establish and resource a new Reading Room at the Library with a special focus on Islamic faith and culture which would enable Christians and others to reach a deeper understanding of Islam and its place in the contemporary world. An area within the existing building was designated for this purpose. This exciting new facility, the 'House of Wisdom', was officially opened in 2011 by Tariq Ramadan, Professor of Contemporary Islamic Studies at the University of Oxford. Like the rest of the collection, the books in this new Reading Room are freely available to all. They complement the courses that are now a regular part of the Library's program and help to stimulate debate about and interest in contemporary interfaith issues, in particular those affecting Christians and Muslims. In 2011, the Library began a program to refurbish and upgrade all its bedrooms. This has now been completed and most rooms have en-suite facilities. The bedrooms have been designed to be comfortable and conducive to study - whether our guests are here for a couple of nights or a couple of months. The generous support of the U.S.Friends of Gladstone's Library played an important part in facilitating the development of the 'House of Wisdom' and the refurbishment of bedrooms. Grants from the U.S. Friends continue to play a vital role in enabling the Library to develop and upgrade its facilities.The provision of a laundry facility for guests was made possible thanks to the generosity of Fritz and Cynthia West while a donation from David Keller and Emily Wilmer allowed the Library to undertake work on the archive of A.M. (Donald) Allchin. The present focus of the U.S. Friends is on supporting the development of the Library's work through the Gladstone's Living Heritage Project. For further information please click here. When was Gladstone's Library founded? Gladstone bought the land in 1889 and the Library opened on February 2nd 1894. William Ewart Gladstone (1809-1898), four times Prime Minister and a Member of Parliament for sixty-two years. He is arguably Britain's greatest statesman. Gladstone founded it as a residential library "for the pursuit of divine learning" which encompassed not just Christian thought but "the various branches of human knowledge, especially history and philosophy". Why do you claim it is unique? It is unique in being the only Prime Ministerial Library in Great Britain and in being a residential Library. When did it become the National Memorial to Gladstone? After Gladstone's death in 1898, the present building was opened as the National Memorial to Gladstone on October 14th 1902 by Earl Spencer. John Douglas was one of the most renowned provincial architects of his day and Gladstone's Library was the most important commission of his career. In 1994, the Library was officially recognized as one of the finest and most important buildings in Wales, both architecturally and because of its historical associations with Gladstone. Gladstone's original donation of 32,000 books has grown into the present collection of 250,000 printed items. The Library is recognized as one of the world's most important research libraries for theology and religious studies. The collection is kept up-to-date and grows each year. It also has an exceptional collection of nineteenth-century material - covering all Arts and Humanities subjects - many of which were owned by Gladstone and include his pencilled annotations. The catalogue is searchable on-line. Twenty-six comfortable bedrooms, many with en-suite facilities and all with free wifi. The Warden, who is always an Anglican priest, is responsible for the day-to-day running of Gladstone's Library. The work of the Library is divided into three areas - Library, Hotel and Development - each area is run by a senior member of staff. There are a further twenty members of staff who are in turn supported by a loyal band of local volunteers. Overall responsibility for Gladstone's Library is vested in a Board of Trustees (not less than five and not more than fifteen) who appoint a Management Committee (four Trustees and the Warden). Gladstone's Library is an independent institution which receives no regular funding from any source. It is reliant on its users and supporters and on its own fundraising efforts. The Library has a proven track record in successful fundraising and has, over the last ten years, raised over $5 million for essential repair and development work to extend and improve the Library's services and facilities. Who can use Gladstone's Library? Anyone: academics, theologians, historians, bibliophiles, writers, clergy, laity, students, schoolchildren, tourists... Our rates are affordable with special discounts for students and clergy. Scholarships are also available. 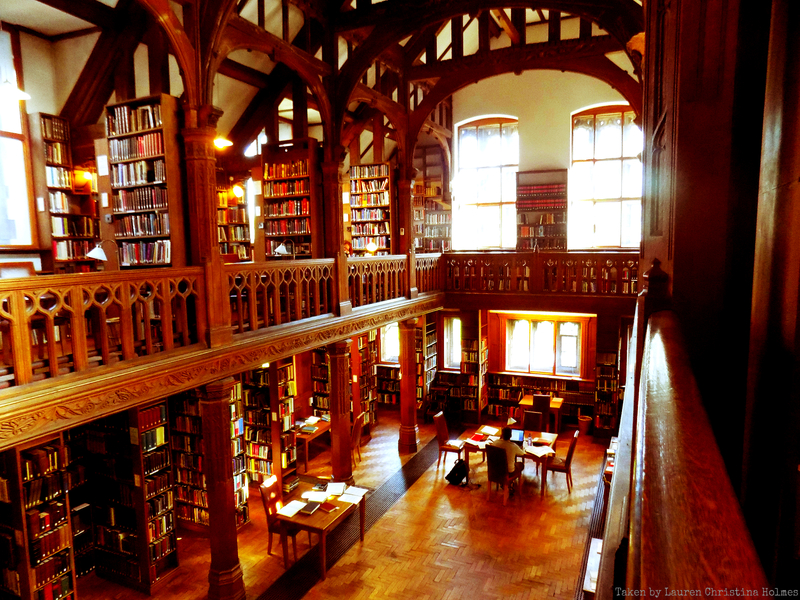 Why should I go to Gladstone's Library? Apart from using the library to read or research, you might want to attend one of our short courses on religious or nineteenth century subjects. You might just want to soak up the creative atmosphere over 170 books have been written or researched here since 2000. Its location makes it an excellent base for visiting Welsh and English tourist sites.